On Friday I had lunch with my mum and my grandma. I was one day late seeing Grandma for her birthday and missed out on being part of the larger family gathering the night before but there were advantages to being there just with my mum and the birthday girl. Grandma finds it very difficult to hear people when there’s a lot of background noise (though her new hearing aides are helping) so it’s much easier to carry on a conversation with her with no-one else around. We talked about curries and Chinese food – Grandma is a fan of both and is disappointed by the curry served at the nursing home, it lacks flavour. She asked how I was getting my housework done now that I’m in paid work – I joked that it wasn’t getting done (except it’s not a joke but that’s not a new situation, I’m not much of a clean freak and besides Adam does at least as much as me round the house). We discussed the trickier clues in today’s Sydney Morning Herald crossword – Grandma does it every day. When asked what I was doing with the rest of my day I said nothing exciting, maybe some laundry, Grandma told me that when her kids were young she swore to herself that once they were out of nappies she was only ever going to wash once a week because she hated it and besides it was more efficient not to wash every day – well it would be if you had to fire up the copper to get it done! It’s no wonder Grandma hated the laundry so much, hand washing and line drying nappies for twins born in mid-winter would traumatise anyone. After lunch we took our cups of tea out to the verandah and sat in the sun for a while, when we went back in Grandma’s glasses (they’re the ones that change tint depending on light levels) were so dark she couldn’t see a thing, had to take them off, it’s a good thing she moves slowly with that walker of hers, a half-blind wheely-frame driver moving at speed would be a right menace. I didn’t have a particularly close relationship with Grandma until I started to spend time with her on my own as an adult. I’m very glad she’s been around for me to get to know properly, and for my kids to have the chance to know her. Your grandmother is SO beautiful!! I wish my grandparents were still around. I talked to my grandma the other night…but it was in my dream. We talked about putting butter on chips. It was nice. We sat on the curb together, chatting. Oh, Mim!! Between this post and the comment you left on my blog post about my grandma… I’m just feeling so blessed to “know” you right now!! Happy Birthday to your grandma!! I never got to really know much of my extended family, being the child of imigrants… I’m loving Facebook because at least now I’m able to chat with my cousins. I’m struggling with a topic for NaBloPoMo today… Not sure what I’ll come up with. 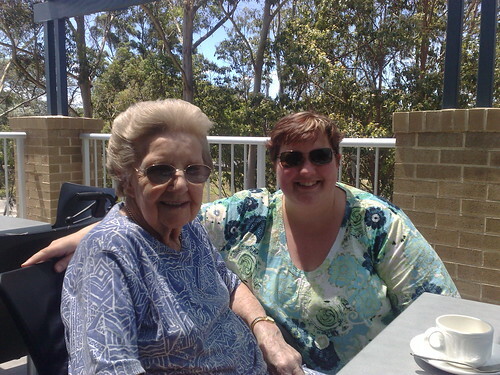 That’s a gorgeous photo Mim of you and your grandmother. It sounds like you had a lovely day. I wish I’d had the chance to get to know my grandparents better, we lived in different cities for a while (us Melbourne, them Sydney) and they all passed away while I was still young (last one at 13). So it is great for you and great for David, Caitlin and Thomas. Twins in mid-winter: that’s what I had too, but with the advantages of automatic washing machines and dryers. My grandmother had twins too, about 1 year after the previous baby, and I think my dad may still have been in night naps. Grandad used to help, a lot! One day he hung 53 cloth nappies on the line to dry. 53 nappies, yikes! Grandma tells me she used to farm the nappies out to the neighbours to hang in front of their fires to get them dry. Wow, she looks great! A belated happy birthday from me too!